The company in a press release Tuesday said HomeKit and AirPlay 2 will arrive as a "mid-year" upgrade for 2019 model year TVs. AirPlay 2 will allow effortless streaming of audio and video content to LG TVs, while HomeKit support will add a wealth of control features that integrate with iOS. With HomeKit, users will be able to turn the TVs on and off, change inputs and more, directly through Control Center. 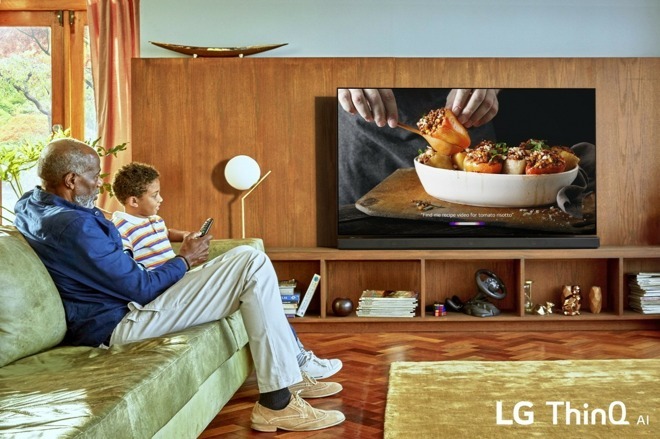 Owners of 2019 LG TVs will also receive a firmware update to add Amazon Alexa alongside the Google Assistant support that is already present. "2019 LG TV owners can also expect to receive a firmware update that will add Amazon Alexa support to complement Google Assistant which is included out of the box, making LG the only TV brand to provide support for both leading AI platforms without the need for additional hardware," LG said. It was during CES 2019 that LG announced support for AirPlay 2, with Vizio, Sony and Samsung also pledging varying degrees of support for their respective products. LG was recently dinged for limiting AirPlay 2 and HomeKit support to its 2019 lineup, both features that other manufacturers are offering to owners of older hardware. A change.org petition was initiated, though LG seems to have brushed it aside. Apple's recent iOS 12.2 beta cycle was the first to include support for HomeKit-enabled TVs. Changes include updates to the Home app and Control Center remote user interface to accommodate controlling televisions and not just the Apple TV. Once iOS 12.2 is released, manufacturers will begin to add support for HomeKit and AirPlay 2 to their sets. Vizio has started a signup process for a beta program of its SmartCast 3 platform, which includes HomeKit and will be available in the first quarter of 2019. As it has done with all the other AirPlay 2 and HomeKit accessories, Apple maintains a list of compatible TV models on its website. Do these TVs get Siri? I thought HomeKit was the developer name. What a terrible name for consumers. Just call it "Home". HomeKit references the underlying API, most Apple API references follow this nomenclature. Home is the App to control everything through a GUI. Do you suppose there's a firmware update that includes Homekit support, but excludes both Alexa and Google Assistant? You know, just in case it turns out that Amazon and Google have decided it's in "our" best interest for them to spy on us even when not using their services. Yeah, my tin foil hat is firmly in place; why do you ask? That’s a sensible question. No tin foil hat required. An Apple tele, in whatever decade they decide to produce one, may be your best hope for TV privacy. All Apple asks for is all our money. So any LG TV you can buy today will not have this firmware update. Even the brand new 2018 LG OLED I bought last week. Not a smart move on LG’s part. They should at least support TVs from 2017 onward after all this is only a firmware update and these TVs already have casting built in so it has the hardware so support the feature. Funny that you asked. All LG ThinQ TV's and other devices work with Google assistant and Alexa. Apple is behind with adoption. A lot of people are on Amazon and Google and Apple is late into this game for some reasons, but it will catch up. LG could care less. Their all new models for last two years are on Amazon and Google solutions and provide equivalent to HomeKit. That is Apple that should care more. It is tight competition. Sorry. My OLED works great and the built in apps are wicked fast. AirPlay support is a more nice to have but it just seeems off they are not supporting recent models unlike what Samsung and Vizio are doing for their TVs and AirPlay 2. It is pretty disappointing that LG are not providing an update to all their high end LG models such as the OLED TVs they released in the last two or three years. It is not as if their TVs were cheap nor a consumable device that can simply be thrown out and replaced with a new feature is released. TVs are generally a 5 year or more life cycle. There is no way the technology within the TV that is 2 or 3 years old cannot support the basic function of AirPlay. LG OLED TVs are fantastic but they don't even bother to update their own OS on recent TVs either a year old. It is a bizarre strategy because it feels like, you pay a small fortune to buy an LG TV but that is where their commitment to you ends. No interest in retaining you as a customer, no interest in making you feel like your investment is at least worth it. It is a shame as their TVs are great but as demonstrated here within months of buying it, its already obsolete, and what was a "smart TV" becomes not so "smart".